Well, I felt it was time for another edition of Things that Make Me #SMH Lately. This a February edition, albeit a few days late. (Some of you may remember my January edition of this.) I am not going to make this a regular or weekly thing. Typically I like my blogging space to be an area of zen, fun, good food, camaraderie, etc. Not a big ole whine and moan session. But lately there have been a few things that have just been making me do a palm plant to my forehead and just ask why... I am just putting this out there because I need to know that I am not the only one. That there must be others who share my same frustrations, right? ;) I got 3 blogger related ones, and 2 IRL ones for you all today. Forcing your followers to follow your blog in another way via a mandatory entry to enter a giveaway on your blog. If I already follow a blogger through GFC or email, I do not also need to be following them through RSS or Bloglovin.) Can we say redundant?? It is only padding numbers. No matter how many ways you try to persuade me to get your blog posts on my laptop screen, I am just ONE follower. It is also insulting & unfair to your already loyal followers who may be happily receiving your blog posts on a daily basis through some other medium other than the one that you are requiring for entry into your giveaway. My advice? Care more about your followers- not increasing your numbers. This one I just don't get, but bloggers who get upset, hurt, and up in arms about mean, hateful trolls who leave crappy anonymous comments on their blogs. There is an easy solution- don't allow anonymous commenting. Done. The state making it so crazy difficult to get a driver's license. I am induced into a paralyzing panic every time I even think about attempting to get a license in my home state again. And the continuous horror stories from my friends & family members about the hours they spent at the DMV just to walk out with no driver's license do not help. No joke- it is easier and faster to legally obtain a gun in this state than to get a driver's license. There is something wrong with this picture. Our immature, "we are going to take our toys and go home" government. DO YOUR JOBS. We, the American people, voted you in & are paying your salaries via our tax dollars for you to do just that. I hope they all realize that while they sit there with their big cushy paychecks and wonderful health insurance (Ummmm... where are THEIR tax hikes?? Where are THEIR cuts?? ), the majority of Americans are struggling and can't take one more hit to their paychecks. And yes, my little family is included in this. Politicians- STOP trying to make the other party look bad & DO YOUR JOBS. 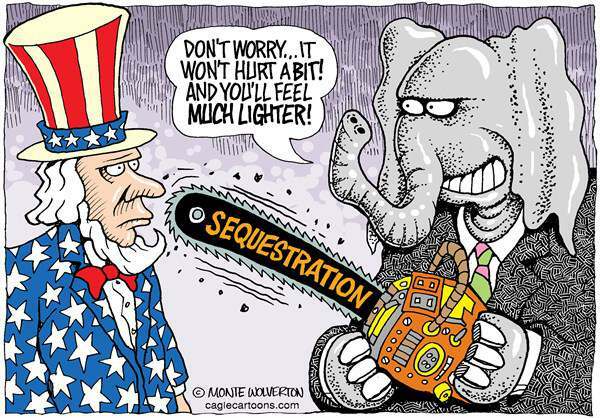 The White House has provided a state by state breakdown of what this sequester will mean for American citizens. Find out how your state would be affected. Then make your voice heard! Can any of you all feel me on these? What has been making you #SMH lately? Haha! I LOVE this post! I have waaaaaay too many SMH moments to comment here, but you may have given me an 'A-HA' for a future post of my own! Keep on rockin' Mama! You're doing a FABULOUS job! I've done a few "Sponsor Giveaways" but once I found out most of these bloggers do mandatory entries I stopped providing prizes for the giveaway and stopped sponsoring them. BK is a Wildland Firefighter for the Forest Service and when his appointment starts in April he will be working at a pay cut. It bugs me to no end that the people we put in charge of making these decisions just up and left. I need to stop there or your comment section will become a huge rant of my own since this all directly effects so many of us. Originally, I was just going to comment to say thanks for sharing the link from the White House. I had been looking for it. I am right with you! DO NOT like mandatory entries..for instance I am not on Facebook, so I have come across giveaway, that facebook (like) is mandatory, so I am out of that one! I am there with you on following GFC, rss and email etc... I dont need to follow them on all those places! People are into the number thing, not me, I want comments on my blog because the reader wants to be there! I got 6,000+ looks on my pink snowball puff cookies and almost 100 comments, thats not because of no giveaway followers thats followers that want to come and read my blog! So I totally agree with you! I don't enter giveaways any more after MULTIPLE blogs didn't come through with the prize. I hate when a link party host want the button on the post. I have a party page. I don't want o litter my posts with buttons that look messy. Now I just won't link to their party. Plus it means that I have to go back to the post and change it and its time consuming. Hi!! I'm a new follower and I just wanted to say thanks so much for hosting this party and letting us link up! !